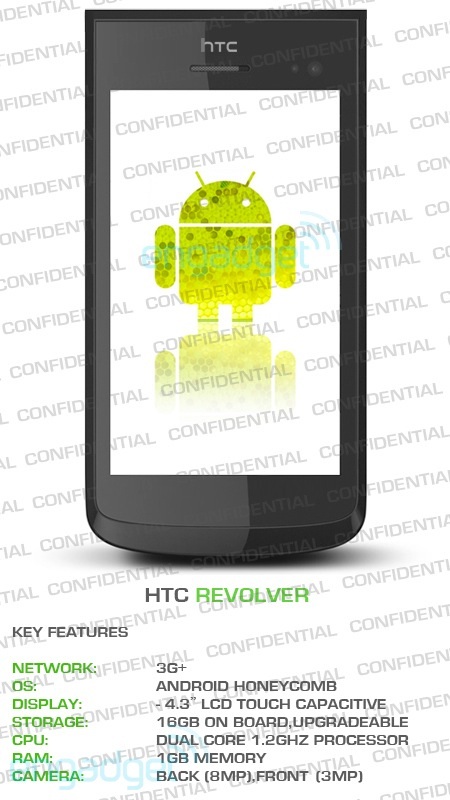 Home » HTC Revolver , New Mobile Phones » AT&T's HTC Revolver with Android Honeycomb? AT&T would very soon be launching the HTC revolver as its premier device and this phone will also mark the beginning of the era of smartphones running on Android Honeycomb operating systems. Google has always maintained that Android Honeycomb has been designed for tablets. It has been optimized for tablets and will be used in most of the recently release tablets like Motorola's Xoom, G slate and Samsung Galaxy 10.1.Android makes an efficient utilization of resources available on a tablet. The other specifications of the HTC revolver include a high speed 1.2 GHz Qualcomm Snapdragon processor, an internal memory of 16 GB, a 4.3 inch touch screen and two cameras a rear one of 8 Megapixel and a front one of 3 Megapixel. Though Honeycomb has been designed for tablets it offers some support for smartphones, by divulging a little bit of details about Honeycomb Google could help hardware designers optimize the hardware for their operating systems. Google has also suggested that it would be merging Android Honeycomb and Gingerbread leading to the evolution of a new platform. With Google's I/O conference taking place shortly we will have to wait and watch out for the versions of mobile platforms Google will be launching.